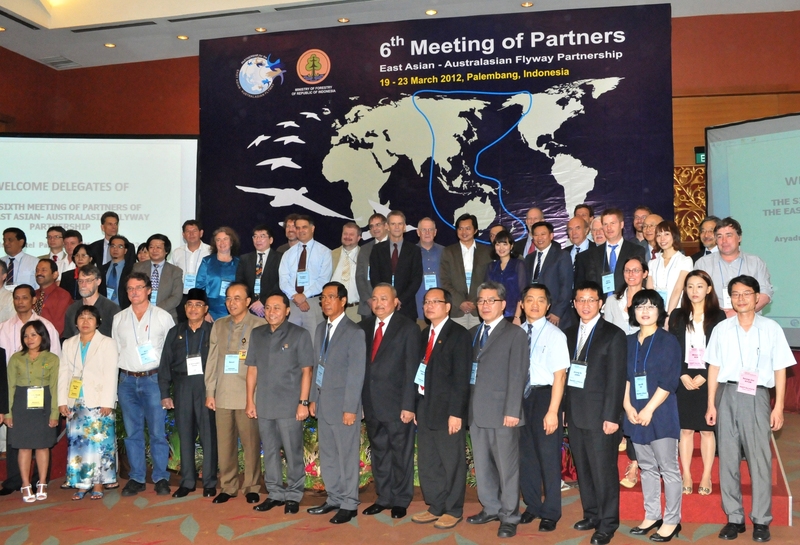 Partner Representatives at the 6th Meeting of Partners, March 2012 © 2012 Partnership for EAAF. 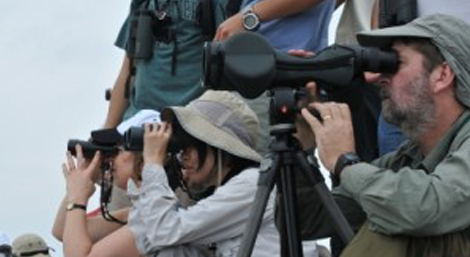 Participants watching shorebirds, seabirds and migratory/resident waterbird species on the boat © 2012 Partnership for EAAF. 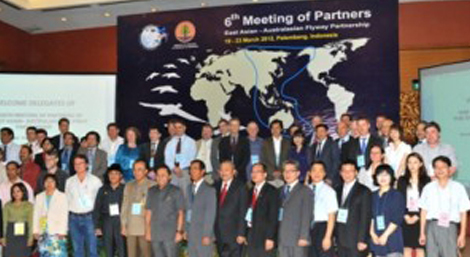 On 19-22 March 2012, the Sixth Meeting of Partners (MoP6) of the East Asian – Australasian Flyway Partnership was successfully held in Palembang, South Sumatra, with 70 international and 30 domestic participants. The meeting was attended by 26 Partners out of 27, three potential governmental Partners, 30 technical advisors and domestic experts. Minister of Forestry of Indonesia, Governor of Sumatra and Head of Banyuasin District welcomed all participants and opened the meeting. This was the second MoP in Indonesia. The Partnership was launched from the first Meeting of Partners in Bogor, Indonesia, November 2006. The Chair of the EAAFP expressed the Partnership’s gratitude to the national, provincial and local governments of Indonesia for hosting this sixth MoP and acknowledged the preparation work of the hosting team and EAAFP Secretariat. This meeting marked the acceptance of three new Partners (Mongolia, New Zealand and Rio Tinto) and the designation of Sembilang National Park, Indonesia. There were presentations from new Partners on their plans and activities for the Partnership, and from governmental Partners on new Network sites since MoP5. Meetings of existing Working Groups (Anatidae, Shorebird, Seabird, CEPA and AI) and Task Forces (Monitoring, Colour marking, Yellow Sea and Spoon-billed Sandpiper) occurred during side event sessions, and representatives of each session reported their work since last MoP5 back to all. Also, the most laborious task, the new Implementation Strategy 2012-16, was carefully reviewed and approved by all Partners for the next term. With the generous host of Indonesia, a full day field trip was made to the Sembilang National Park famous for its extensive intertidal mudflats and mangroves. Sembilang National Park has been designated as the 108th EAAF Network site on the basis of its international importance for migratory waterbirds. The site is the country’s second network site after Wasur National Park in Papua. This status gives the park the recognition of a crucial wetland for migratory waterbirds. During the trip, participants observed big population of vunerable Milky Stork (Mycteria cinerea), Lesser Adjutant (Leptoptilos javanicus), Nordmann’s Greenshank (Tringa guttifer), Chinese Egret (Egretta eulophotes) and many other migratory and resident waterbird species. A large number of Asian Dowitcher (Limnodromus semipalmatus) was also observed and the species for which this area are of critical importance.